Imagine a fabulous Mexican meal. Whether it is a tacos, fajitas, or burritos, the wonderful contents are always wrapped in a tortilla shell. There are many variations on the tortilla shell, whether it be soft or hard, corn or wheat, with spices or flavouring. Well, even on IP, you can have a tortilla shell! 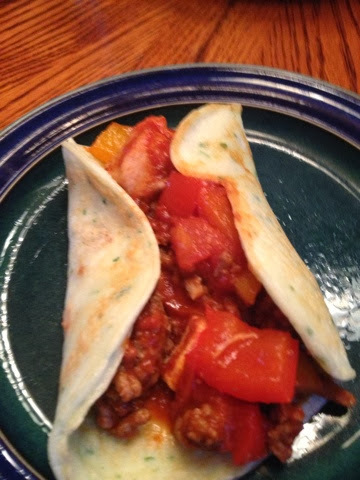 I was having thick chili for dinner, so I thought a tortilla shell would be great to have with it. The recipe is extremely easy. Just add water to the potato purée, spray a frying pan, flip once, and you're done. The taste was fabulous. At first, I thought it looked too much like a pancake and wasn't sure what it would taste sweet, somehow. But it was a great vessel for my fabulous chili, and it would be great for as a taco or fajita shell. I loved that I got to have two tortillas out of one packet. It was thick enough to hold up to my chili. I might experiment with a bit more water so that I can have a slightly bigger tortilla. Not sure how thin it would be possible to go before it would not hold up, but I will try and let you know. Overall, very tasty and very adaptable to a number of meals!